Renewing your passport can make an exotic trip abroad seem like a total nuisance. Because we're all grown-up babies in reality, dealing with the bureaucratic hurdles of waiting in endless lines and shelling out a soul-crushing fee makes passport applications and renewals about as an endearing as a root canal. And it often takes weeks. But luckily, Qantas Air is here to alleviate this perennial travel headache by paying for your passport fee if you buy a ticket to Australia on any of its flights from the United States. 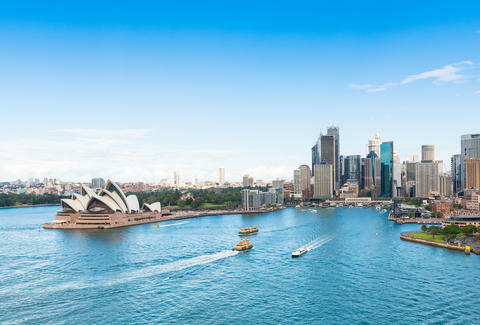 The Australian airline announced the deal on Thursday to bolster tourism to the Land Down Under in conjunction with the rollout of its new 787-9 Dreamliner jets. If it sounds like a stroke of luck that should compel you to visit the marsupial-laden continent, which boasts miles of glistening natural beauty and a rich tradition of punchy kangaroos, then heed the fine print: Qantas is offering a $135 discount off the base fair of tickets to Australia, which is the approximate price of standard passport fee. All you need to do to redeem the deal is head to qantas.com/passport, then enter the promo code: "PASSPORT." The redundantly simple process will earn you a $135 reimbursement on your ticket, and it's valid for every US citizen, regardless of whether you currently have a valid passport. The airline understands Australia is something of a hinterland for Americans, but Qantas executive Stephen Thompson wants to change all that, saying in a statement: “Australia is in the top five destinations Americans would consider traveling to in the next four years, yet more than half the population do not hold a valid passport." Thompson's words add heft to the pitch, seeing as only 40% of Americans maintain valid passports as of 2016, according to the State Department. “As Australia’s national carrier we are proud and excited to share all that Australia has to offer – from our amazing beaches and Great Barrier Reef, the natural beauty of our outback, the buzz and excitement of Sydney’s harbor to our award-winning wine regions," he continued. In any case, as cheap flights to Europe became an evermore common amenity, it might be time to consider heading in a different direction, especially since an airline is actually willing to help get you there. Just don't provoke any kangaroos.